John Burnham Schwartz gives us an imaginative tour de force inspired by the dramatic real-life stories of the reigning empress and crown princess of Japan. The novel’s narrator is Haruko, Empress of Japan. In 1959, at the age of twenty-four, she marries the Crown Prince, becoming the first non-aristocratic woman to enter the longest-running, most hermetically sealed-off, and mysterious monarchy in the world. Met with cruelty and suspicion by the Empress and her minions, controlled at every turn, Haruko suffers a nervous breakdown and loses her voice. Yet she recovers and perseveres, holding tight to the self that the imperial bureaucrats would see crushed. When thirty years later—now Empress herself—she plays a crucial role in persuading another young woman—Keiko, a brilliant foreign servant who dreams of having a career—to accept the marriage proposal of Haruko’s son, the Crown Prince, the consequences are tragic and dramatic. 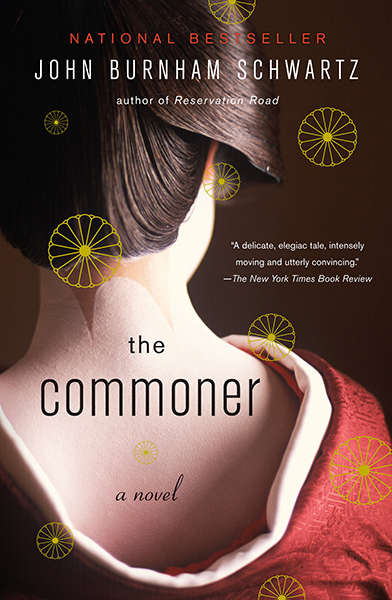 Meticulously researched and brilliantly imagined, The Commoner is the mesmerizing, moving, and surprising story of a brutally rarified and controlled existence at once hidden and exposed, and of a complex relationship between two isolated women who, despite being visible to all, are truly understood only by each other. With the unerring skill of a master storyteller, John Burnham Schwartz has written his finest novel yet.